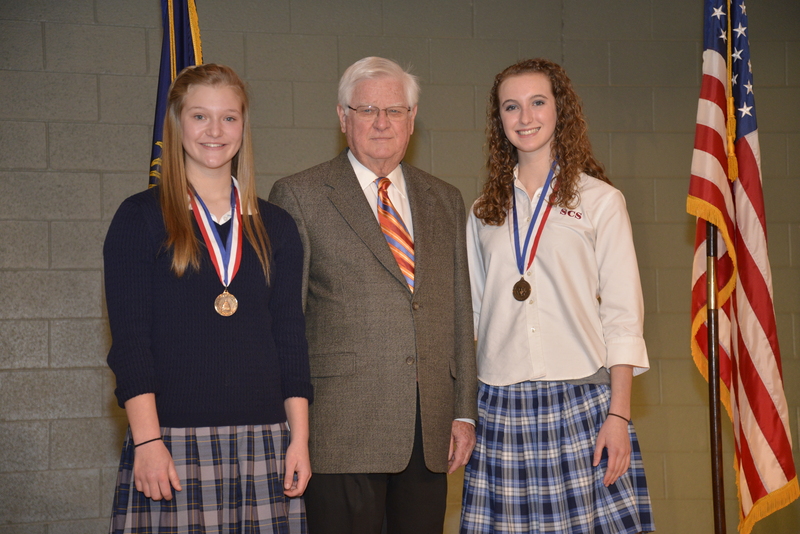 SOMERSET, KY - Today, Congressman Harold “Hal” Rogers (KY-05) presented two Somerset Christian School students with the Congressional Award Bronze Medal during an assembly with nearly two hundred middle and high school students. Sisters, Gabrielle and Audrey Moore earned the Congressional Award Bronze Medal through volunteer efforts to improve Pulaski County and achievement of personal development goals. Gabrielle and Audrey's work exemplifies the cornerstones of the Congressional Award: service to others, initiative and achievement. The Congressional Award is open to all young people ages 14-23 in America. To earn the Award, young people must set and achieve goals in the four program areas: voluntary public service, personal development, physical fitness and expedition/exploration. Gabrielle's volunteer service project included working with the Lifeline Foundation to provide developmental activities for infants, toddlers and preschoolers. Audrey's volunteer efforts were highlighted by helping organize a softball team for children with special needs. She worked diligently to recruit sponsors for equipment and uniforms. Gabrielle and Audrey Moore are the daughters of Dr. John and Kim Moore of Somerset, Kentucky.